This past Friday I came face to face with vulnerability in the worst way. Just prior to leaving to facilitate my morning circle of women I received a text that one of the woman’s son had been killed in a car accident the night before. She and three of her closest friends, who are also in the circle, would not be coming, but the rest of us would gather like we do every Friday, and I knew that we would devote our practice to Jen and hold her in our hearts. As I was driving, I thought to myself, I don’t know how to do this. I don’t know what to do with this kind of heart wrenching pain. I don’t know how to be with this depth of sorrow and loss. I don’t want to face this level of vulnerability. I’m not capable of holding it together for everyone. And so I showed up and so did the others. We gathered, eight tender hearts, and we spoke of our sadness, our fears, our grief, and our confusion. We called upon our ancestors who’s wisdom on death is so much richer and deeper than ours. We asked to unlock the knot in our bellies, the lock that wants to keep this pain far, far away - that doesn’t want to see how vulnerable and fragile life is. We courageously softened into the pain, we saw it, we held it. We held Jen. We held Ryan. We held their family. We held our children. We held our pain. We allowed ourselves to see and feel vulnerability. It was very difficult and it was beautiful. I had planned to speak about vulnerability this Monday and to base our qigong practice on the feelings of vulnerability, but I certainly didn’t expect to get walloped in the stomach by it just a few days before our class. So far in my life, I’ve had many opportunities to dispel the myths around vulnerability, and each time I discover a new level of connection, as uncomfortable as it is! 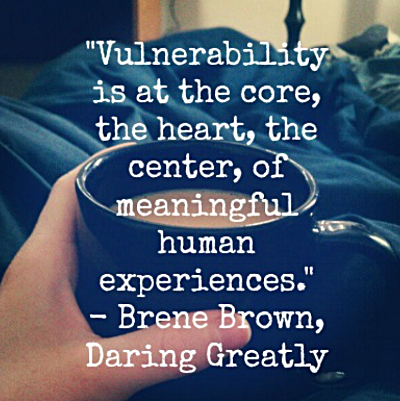 Dr. Brene Brown is one of my favourite experts on the subject of vulnerability and it is mostly her work that I chose to focus on today. Though I also highly recommend the book “Broken Open: How Difficult Times Can Help us Grow” by Elizabeth Lesser. Dr. Brené Brown is a research professor who has spent the past sixteen years studying courage, vulnerability, shame, and empathy and is the author of four New York Times Bestsellers– The Gifts of Imperfection, Daring Greatly, Rising Strong, and Braving the Wilderness: The Quest for True Belonging and The Courage to Stand Alone. Vulnerability is the birthplace of love, belonging, joy, courage, empathy and creativity. It is the source of hope, accountability and authenticity. If we want greater clarity in our purpose or deeper or meaningful spiritual lives, vulnerability is the path. A new kind of power will emerge from vulnerability. The more honest we are with ourselves about how we feel and what we really think, the more power we will have. We may have once thought that being powerful meant not getting in to what we felt, what we thought, or who were really were. But that attitude didn’t garner power for us. It caused life, the universe, us to continue creating situations that would help open our hearts, helps us to feel, help us learn the lesson of vulnerability. The sooner we become honest with ourselves, the sooner we can be honest with others. The sooner we become honest with ourselves, the more quickly we’ll grow and move on to a new place. Become vulnerable, at least with yourself. Be honest about what you think and how you feel. Write it. Speak it. Feel it. Release it Then you will know where to go, when to go. What you are to do next will emerge naturally, quietly, and clearly. Thank-you ladies for sharing another heartfelt circle and practice today!